First 4 Figures presents one beast of a statue! 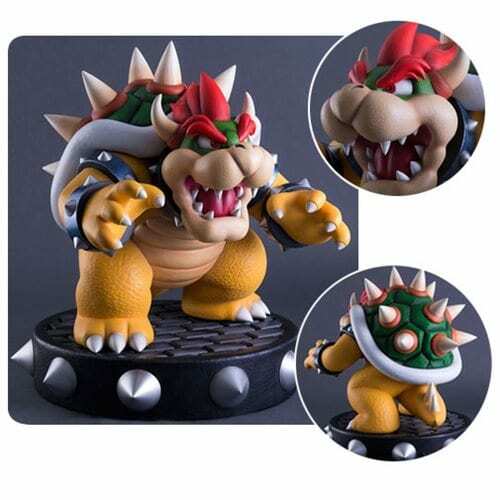 Based on his appearance in the New Super Mario Bros. game and others, the primary antagonist of Nintendo’s Mario franchise comes to 3D life in this massive 19-inch tall statue. Ready to catch Mario – or maybe your cat – Bowser is cast in high-quality polystone and finished with hand-painted perfection. Fans can pair this magnificent piece with First 4 Figures’ Cat Mario Statue (sold separately) to expand and enhance their Super Mario or Nintendo collection! The New Super Mario Bros. Bowser Statue measures 21-inches wide x 19-inches tall x 19-inches long and weighs about 44 pounds. Run, Mario, run!